In June 2009, at a meeting under the name of Wiveliscombe Transition Initiative, a number of local people, with longstanding concerns about environmental issues, got together to discuss the potential for a community group developing the renewable energy resources of the area. The thinking was: we have trees, wind, and sunshine and other resources, and we know these can be usefully harnessed to produce energy – shall we wait for someone else to do it for us, or shall we get on with it ourselves? A working group formed to take the concept forward, leading to the formation of the Brendon Energy Project (BEP). We realised at an early stage that the key was to identify what resources, and what technologies, were most suitable for our area. So BEP applied for and obtained grant funding from Western Somerset Local Action for Rural Communities, and support from Taunton Deane Borough Council. With this money we commissioned a feasibility study into four technologies from local environmental consultants Aardvark EM Ltd.
Aardvark’s study looked at anaerobic digestion (the generation of electricity from food and farming waste), biomass (wood or energy crops), wind turbines and solar. Aardvark concluded that solar PV panels were the most suitable and cost-effective technology at the time. BEP immediately started to approach the owners of suitable roofs! We had discussions with local schools and village halls, proposing that, in return for them lending us their roof-space to install solar panels, they would enjoy free electricity while the panels were generating. That way, they would benefit from lower electricity bills, and Brendon Energy would receive the revenue from the Feed in Tariff, to allow us to buy more solar panels, or invest in other projects. We also contacted local solar installers for quotes. It rapidly became clear to us that there was no shortage of suitable roofs, but rather shortage of money would be the problem. No money = no solar panels = no renewable energy generation. We therefore decided to form Brendon Energy as an Industrial and Provident Society for the benefit of the community. Put simply, a not-for-profit body which everyone in the community can partly own. 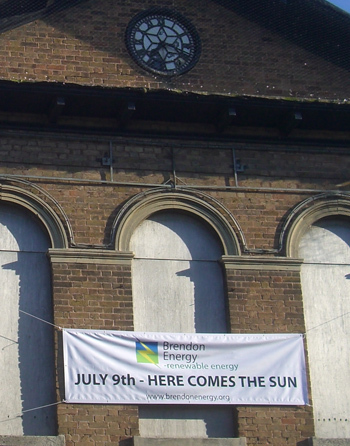 For as little as £10, you could buy shares in Brendon Energy and have a say in how it is run. Brendon Energy Limited (no. 31263R) was formed in April 2011 and registered with the Financial Services Authority in May 2011. Its constitution is in the form of Rules registered and approved by the FSA. Brendon Energy’s aim is to develop local renewable energy resources which benefit the local community. Solar panels should just be a start point. In the future we will be investing in other technologies, and producing more and more renewable energy.